What is left of a more extensive farmstead on the North Dakota prairie. 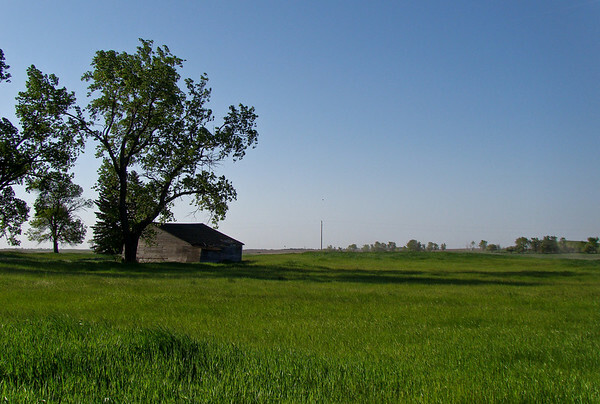 A large shelter belt attests to the fact that someone used to live here, but farm consolidation moved the dwelling away from this corner of the prairie. The light is the real subject here. Light and shadow, both on the large scale and on the local, as in the molding of the grasses. We are far north here, and the shadows are long even an hour after noon. Sony DSC H50 at just under 50mm equivalent. F5.6 @ 1/640th @ ISO 100. Programed auto. In Lightroom, cropped from the bottom to improve composition. Added Clarity, Vibrance, Contrast, and Sharpen landscape preset. Recovery to darken the sky.